Learn why cellulose insulation is the ideal option for your home. If you're looking for an effective, environmentally friendly insulation option for your home, cellulose insulation is a great choice. Cellulose insulation is made from old newspapers and other waste paper that would otherwise be dumped in landfills. Cellulose insulation is blown into attics or wall cavities to provide a thick layer of insulation that provides the R-value your home needs. 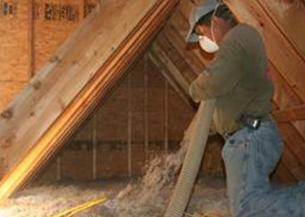 Dr. Energy Saver specializes in cellulose insulation, and we can help you get the right services for your needs! If you're interested in cellulose insulation for your home, contact us today to get started with a free estimate. Cellulose insulation is made from recycled materials that are ground into a fluffy, lightweight material with insulation value as high as R-4 per in. The insulation is treated with a nontoxic borate solution that gives the material a Class 1 fire safety rating (the highest available), while also making it resistant to mold and insects. Dense-pack cellulose: Dense-pack cellulose is used to insulate wall cavities and other enclosed spaces. This application technique calls for 2-in.-diameter access holes to be drilled into the cavities, so that a small application nozzle can be inserted to inject the insulation. This method completely fills the space with the maximum amount of insulation, as the name suggests. Access holes are plugged when the job is complete. If you have insufficient insulation in your attic or walls, cellulose insulation from Dr. Energy Saver could be the right answer for your home. Our insulation experts will evaluate your home and recommend the right cellulose insulation services for your needs. Contact us today to get started with a free estimate on cellulose insulation for your home!